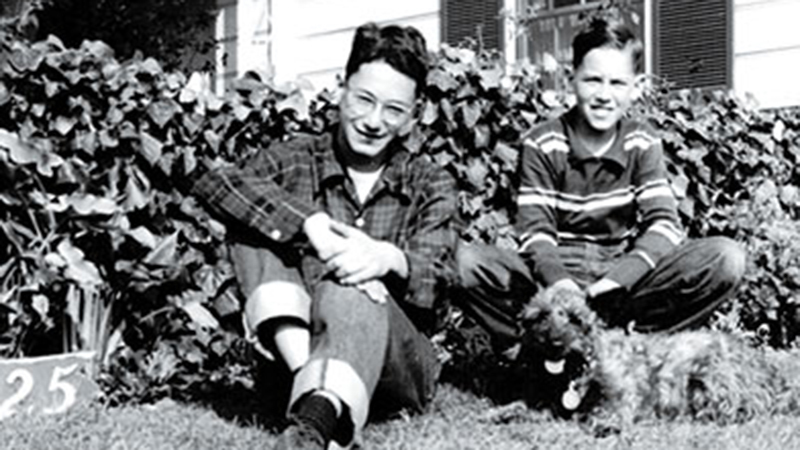 The author (right) and his brother, Jim, in 1950. A family mental illness launched me on a quest. I left Harvard Law School because of what happened to my older brother, Jim, a graduate student in English literature at UCLA. One day in 1958, Jim phoned our house and started shouting at Mom: “I’m with a girl, and I’ve got a gun. I’m going to shoot her first and then myself.” Mom reasoned and pleaded with him, but the conversation abruptly ended when Jim slammed down the phone. Fortunately, he did not do what he said he would do, but soon he was hospitalized and treated with electroconvulsive shock therapy. Once I realized that Jim would struggle the rest of his life with schizophrenia, I began asking questions. Our family was conventional and well educated, with no history of mental illness. So why did Jim, of all people, get schizophrenia? Was it my parents’ fault, or even my own? What, exactly, was wrong with him? And was the problem in his mind or in his brain? Not much was known about schizophrenia in those days. Psychological theories—and psychoanalysis—dominated. My mother revered Sigmund Freud, so she must have known that one of Freud’s disciples blamed “schizophrenogenic mothers” for the disorder. What guilt she must have felt. Dad, too, was devastated; he had envisioned a brilliant career for his intellectually gifted eldest son. At the same time, certain antipsychiatry authors were claiming that mental illness is only myth, and One Flew Over the Cuckoo’s Nest, Ken Kesey’s novel portraying mental hospitals as places of horror, became a best-seller. Nothing I learned as an undergraduate at Stanford gave me any real insight into Jim’s condition, not even the course in abnormal psychology. My interests turned to politics and law as I attempted to bury my concern and move on. When news came that I had been accepted into Harvard Law School, I knew that it was the opportunity of a lifetime. I vaguely imagined a career as a civil rights lawyer. But in my second year at Harvard, Jim’s condition worsened, and I couldn’t focus on my legal studies. I was approaching the age at which Jim had experienced his first psychotic episode, and I still did not understand what had caused his illness. I feared that something similar might happen to me. So I left school and took a job as a bookseller in Harvard Square. There, I had time to ponder schizophrenia. The more I thought about it, the more I became puzzled by the term “mental illness.” I began to believe that mental illnesses—at least the major disorders like schizophrenia—are not in the mind but, rather, in the brain. I reasoned that no nonphysical thing, a mind, could possibly govern a physical thing like the brain, and it was the brain that mattered, because it controls behavior. The mind, I concluded, must be an aspect of the brain’s function. My housemate at the time was a PhD student in biology at Harvard, and he encouraged me to apply to MIT for graduate studies. The psychology department (later the Department of Brain and Cognitive Sciences) was new and small in 1965. Its chair, Hans-Lukas Teuber, embraced a vision of psychology that included the blossoming field of neuroscience. My supervisor, Peter Schiller, encouraged me and a fellow doctoral student to construct our own lab and design our own experiments. Nobody was researching the neural basis of schizophrenia, but I didn’t care, because I just (just!) wanted to learn how the brain works. I thought, Once I know about the normal brain, I will understand its malfunctions. I ended up studying the visual pathways. Later, I took a job at McGill University, and there I taught neuroscience for 38 years. I no longer worry about why my brother got schizophrenia. At MIT, I learned that the brain is marvelously complex. Several specific abnormalities have now been associated with schizophrenia, and scientists have proposed realistic hypotheses for causes that are rooted in brain defects. Mom and Dad suffered feelings of bewilderment, guilt, and shame for the remainder of their lives, but I overcame them because I was able to explore the possibility that science could explain Jim’s condition. From this understanding will come effective treatments and possibly even preventive measures. Most of my Harvard Law classmates became rich, and a few became famous, but I got peace of mind. Ronald Chase, PhD ’69, is the author of Schizophrenia: A Brother Finds Answers in Biological Science, published by Johns Hopkins University Press in 2013.